Having caught a bus to school & home again almost everyday of my life while completing my secondary school education I know only too well the unique odour of buses! The Bio Bus however has taken this to an eco level by using the gases produced by human & food waste & turning it into fuel. Biomethane gas is generated during the treatment of sewage & food waste. 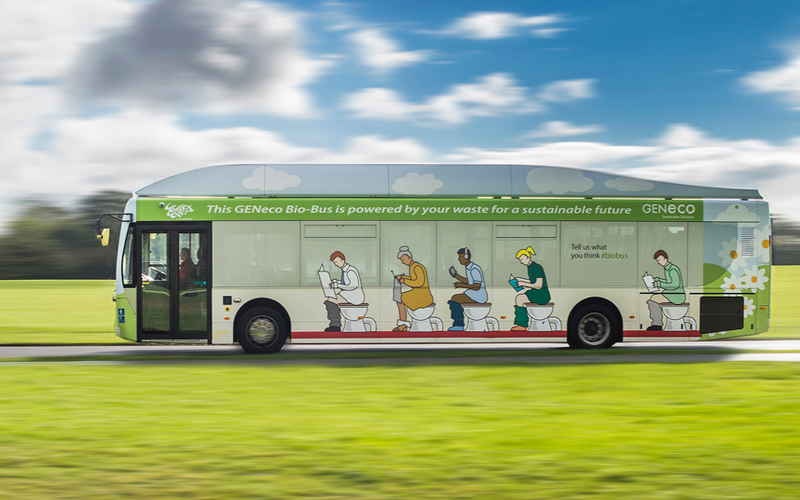 Bristol sewage treatment works generates the gas that is currently being used to fuel this Bio Bus. The bus itself is run by Bath Bus Company & is used to transport passengers to & from Bath & Bristol Airport. Vehicles powered this way will help to improve the quality of our air & recycling waste that is available regardless, such as food waste for example, is also important as it helps to solve the problem of where to put it. GENeco, who run Bristol sewage treatment works, have also become the first company in the UK to inject gas generated from human & food waste into the national gas grid network. This entry was posted in News and tagged bath, Bath Bus Company, bio bus, bristol, education, food waste, GENeco, sewage. Who Resolved To Get Fit This Year?